This week it seemed like it was Christmas vacation again – it was one of the most completely sideways market condition for the past months. After being stuck in a range of about 250 pips last week, this time EUR:USD didn´t move more than 150 pips probably based on the indecision about the result regarding the conversations between Europe and the new Greek government. The market seems to be hanging on every news around this subject. Swiss Franc crosses now at a stable yet surprising tight range while Cable seems to be showing renewed strength after bouncing on the 1.50 level – as mentioned last week – as price action is continuously hitting new highs since the end of January. CAD, AUD, NZD also stuck in about the same price as last week against the US dollar. 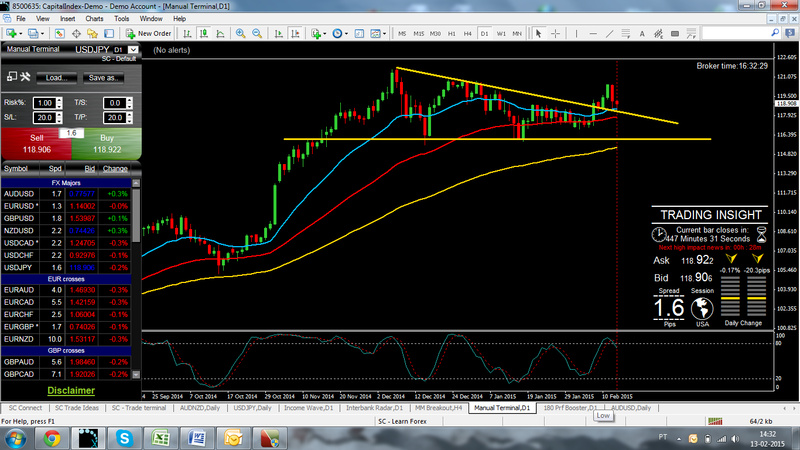 USD:JPY was the only surprise after the breakout of the descending triangle on the 10th – now retesting it. Regarding the Indices, the European side still presenting the back to normal movements to the uptrend as CAC and DAX are currently at new all time highs after the pullback. 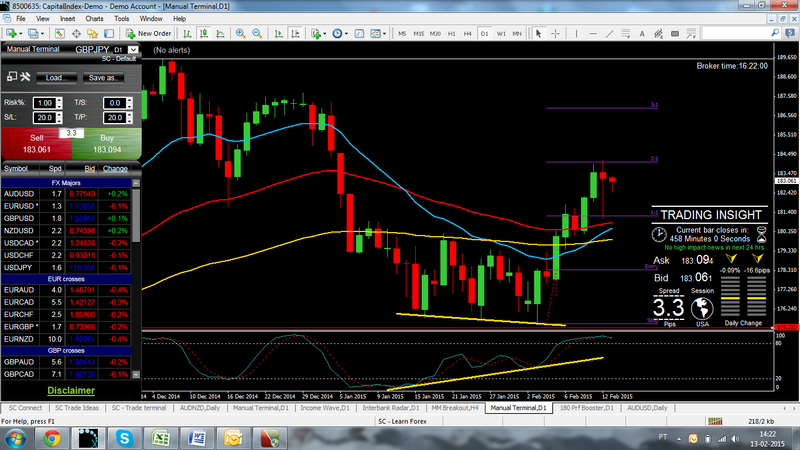 On the other hand, FTSE is still retesting the 6850 level. The American indices seem to be hitting the all time high although (at this time) price is not showing any convincing signals of a decisive move. On the Asian side, Hang Seng still below the record high 25350 even after breaking the range between October and December, as for the Nikkei it is now retesting the all time high at 18094. As for the main commodities, Gold and Silver are now at a continuously pullback to the downside for the last 3 weeks. GBPJPY (4h Chart) – Reversal long – 04.02.2015 – Bouncing of the support level at 175, this engulfing low test bar and the divergence on the stochastic oscillator was the perfect setup for this reversal on the 4th. Currently at almost +2%, the decision is whether this is a reversal back to the next resitance level or to play it safer… Anyway, protect your capital before anything else. Regarding the news, it should start slowly with the Bank Holiday in the US on Monday but we expect the markets to come back to normal by Tuesday and the Monetary Policy statement should be the 1st kickstart as the day will end with the announcement from the chairman of the Swiss National Bank. On Wednesday, the Bank of Japan press conference might also shed some light on the direction of the JPY crosses. USD:JPY – break to the upside of the descending triangle on the 10th and now the following retest seems to be a rerun of the breakout in August 2014. Indices: CAC and DAX apparently breaking new records every week so it is advisable to wait for the pullback before placing a (new) trade. For FTSE and the American Indices, we will wait for the break of the high as confirmation for placing an entry – either as soon as it happens or after the first pullback. Gold and Silver at that limbo between continuing the drop to the downside and returning to the overall downtrend from last year or, on the other hand, regaining strength and getting back to the uptrend proven by the higher highs and higher lows since the reversal patterns in November.